Pathways to Deep Decarbonisation in 2050: How Australia Can Prosper in a Low Carbon World presents an illustrative deep decarbonisation pathway for Australia - just one of many possible pathways - developed using a combination of well-established modelling tools to identify feasible and least-cost options. The frame of reference for the analysis is that all countries decarbonise by 2050, consistent with the objective of limiting the increase in global mean surface temperature to 2°C in order to avoid dangerous climate change. 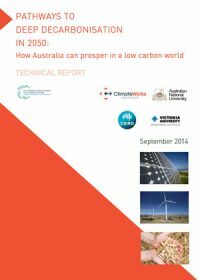 This initial project report shows that Australia can achieve net zero emissions by 2050 and live within its recommended carbon budget, using technologies that exist today (including carbon capture and storage), while maintaining economic prosperity. Major technological transitions are needed in some industries and many activities, but no fundamental change to Australia’s economy is required. Economic activity and Australian incomes keep rising. The economy grows by 150% to 2050, while net emissions fall to zero and energy sector emissions are reduced by more than four fifths. This report is accompanied by the Technical Report which gives detail on assumptions, data, modelling tools and detailed results. 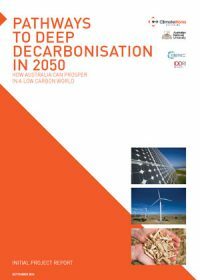 This report presents the technical analysis supporting ClimateWorks’ Pathways to Deep Decarbonisation in 2050: How Australia Can Prosper in a Low Carbon World. It provides readers with details on assumptions, data, and modelling tools. This Technical Report provides detailed results and a discussion of limitations.